The following narrative report with photographs and drawings is being published in the Journal because it is a fine example of the techniques employed in collecting the essential ingredients and data from a UFO landing trace case. Even though the ultimate results are not as significant as the Delphos, Kansas case of November 2, 1971, the investigators involved demonstrate the procedures recommended in the third edition of the MUFON Field Investigator’s Manual. This report should be a guide and incentive to train more investigative teams to have this capability…..
On April 10th, 1983, an unknown craft landed in Ross, Ohio. The unknown object was initially observed by two separate motorists. Mrs. X was driving on Layhigh Road near Route 748 leaving Ross, Ohio, when she noticed a large bright white light to her right. As the object got closer, the lights in the car started to flicker and her car’s engine almost stalled-out. She first thought it was a plane, but then realized it was moving faster than a plane, plus it seemed that the object was coming down. After the object had passed her, the lights and car’s engine returned to normal. She estimated that the time of her sighting was around 8:20 PM. Mr. Jeffries, the second motorist, was driving towards Layhigh Road on the Hamilton-New London Road when he saw the object. He too described the object as being a large bright white light. His car also acted in the same manner as Mrs. X’s car when the object got closer. His car functioned normally after the object passed out of sight. Mr. Jeffries stated that the object was decreasing in speed and seemed to be descending. His sighting took place around 8:30 PM. Later that night, Mr. Jeffries contacted OUFOIL and reported his sighting. The main witness in this landing case, a Mr. C.H. (pseudonym), was watching television on the night of the incident. The vertical hold on his set started to roll and the lights in the house flickered. Mr. C.H. thought that someone had again hit the utility pole down the road. As he started to go to the kitchen, the TV set went off entirely, along with the lights in the house. He assumed that there was a complete power failure. When looking for a flashlight, the TV set came back on and so did the lights in the house. Mr. C.H. made his way to the kitchen to look out his back door to see if someone had hit the utility pole. He stated that he couldn’t see anything wrong, since there were no sparks or lights coming from that direction. While all these events were happening inside the house, his dog continued barking. He thought that he could calm his dog down by going outside. Mr. C.H. felt that his dog had detected some animal, thus explaining his extensive barking. Mr. C.H. turned on the back porch light and went outside to calm his dog. He observed that the dog’s hair was standing up on his back and that he was both growling and barking. When he tried to calm him down, the dog continued unabated. Mr. C.H. turned to the direction in which his dog was barking and that’s when he saw a flicker of light down in the field. He estimated that the light was some 300 to 400 yards from the house. His first thought was that some kids were in the field, perhaps looking for night-crawlers. He directed his attention to the light source for several minutes, while trying to calm his dog. The light repeatedly changed from bright to dim. He called out, but got no response from anyone. Mr. C.H. then decided to go back into the house and call the sheriff. As he started into the house, the light source got very bright and his porch light went out. He turned quickly toward the source of the light and saw something rising in the air very slowly. He said the light was so bright, that it illuminated his entire field. When this thing got several hundred feet above the ground, the bright light dimmed and flickering lights could be observed. As this lighted object increased in altitude, it suddenly took off like a jet aircraft. After the unusual object had departed, his dog calmed down somewhat. Mr. C.H. then went back inside the house and took his dog with him. He found that the television set was now working normally and the lights were functioning properly. As Mr. C.H. sat in his chair, he wondered what he had witnessed. So many things ran through his head, he started to call the sheriff several times, but decided not to. While contemplating what had just happened, he remembered having called a UFO organization in 1974 about a previous sighting. His search disclosed that the organization and number was that of the Ohio UFO Investigators League. Mr. C.H. called and related what he had just witnessed. An interview was set-up that same night. He stated over the phone that he was a little shaken and would welcome the opportunity to talk to someone in person as soon as possible. OUFOIL sent three investigators, Ron Schaffner, Bill Johns and myself to investigate the case. We arrived at Mr. C.H.’s residence before 11:00 pm. It was obvious that the man was visibly shaken from some experience. We began our interview around 11:10 PM and finished at 12:22 AM. During the interview, Mr. C.H. related what he had witnessed and we asked the appropriate questions. Preliminary tests were conducted to measure Mr. C.H.’s eyesight. After Mr. C.H. related his story, we replayed the tape for him to hear and to make additions or corrections. He had nothing to add at that time. At this point, we had Mr. C.H. sign special legal forms giving us permission to investigate on his property. Ron Schaffner explained each and every form to Mr. C.H. Since it had been raining for several days, I called the Weather Bureau to determine if the rain was going to continue. The weather station said that there would be rain on-and-off all through the night and it would continue thru the next day. Having finished with the forms, we all proceeded to the landing area. During the interview, Bill Johns had gone to the area to check for any signs of radiation. When we reached the landing area, Bill stated that he could only pickup normal background radiation. The area was checked with a portable survey meter model 3009. We could see the impression of something which had apparently landed. It looked like there was a burnt spot in the middle and there were many broken tree branches inside the impression. We assumed that the unknown craft had broken these branches from the nearby tree when leaving the area. The branches weren’t crushed or broken into small pieces. There seemed to be a small indentation in the ground left by the unknown craft. Because of the extremely wet ground, we recognized that an exact weight measurement would be difficult. Ron was taking as many photos as possible, but with the rain coming down, we would have to determine later if they were satisfactory. Since the weather conditions prevented us from conducting our field investigation, it was decided to protect the landing area from additional rain. We erected a waterproof cover over the landing area, which rested approximately one-half inch above the ground. At no time did we touch or enter the effected area. In order to prevent the cover from touching the ground, due to the weight of possible water resting on it, we used several dozen air-filled balloons and placed them under the cover for support. With the area well covered, we left the scene and planned to return early in the morning to conduct a full field investigation. When we returned the next morning, Ron began taking a whole series of photographs to document the area. While Ron was taking photos, Bill and I checked the area again for signs of radiation. This time we used a portable survey meter model 3007 with a 3056 probe, which has a low background steel body for shielding background radiation. Each of us wore a dosimeter model 862 during the entire field investigation. These instruments were loaned to us by the Civil Defense. At no time did we ever detect radiation, except for the normal background. The next procedure was to remove the light weight cover which we had erected over the landing spot. The balloons accomplished their job. No part of the cover touched the landing area and no puddles of water had collected on the cover during the night. The cover was removed with great care so as not to disturb the landing area. With the cover removed, we made a visual check of the landing area. The landing area looked normal, except for a burned spot in the center. The outer fringes of the landing spot seemed to be scorched. Inside the landing area there were several broken branches, which it is assumed the unknown craft knocked from a nearby tree when leaving. The surrounding area seemed to appear normal and it too had several broken branches which came from the nearby tree. A series of photographs were taken by Ron to document the evidence. While Ron was busy taking photographs, Bill and I began setting up a directional line. We measured the landing area without going inside the effected area. It measured 50 feet in diameter. Our next procedure was to build a grid pattern over the effected area. When the grid was completed, it consisted of 24 different sections which would be investigated and identified independently. At 9:32 AM, I prepared to enter the first grid section for a search investigation. I was wearing proper protective clothing and carried the needed equipment. Each grid section was completely photographed before an entry was made. It is very necessary to photograph each section so the laboratory scientists will know where the samples were taken or where any unknown artifacts were found. After I thoroughly investigated each section, I also took a core sample from each one. The core samples were taken with an 18 inch galvanized pipe with a 1 inch diameter opening. Only 12 inches of the pipe was driven into the ground. Each sample removed was properly sealed and tagged to identify the section of its origin. At various points within the grid, I also took 36 inch depth soil samples with a Hoffer soil sampler. It wasn’t necessary to take a 36 inch core sample from each grid section, since the effected area showed no signs of anything unusual. This was later confirmed when I performed a soil chemical test in the field. The tests showed that the soil hadn’t been altered by the unknown craft. The soil test I performed was a simple test done with a LaMotte soil test kit. It is a kit which tests for preliminary investigation on soil reaction. It employs the simple spot plate method, using a single indicator solution covering acid, alkaline and neutral soils (pH 4.0-8.0). The ideal kit would have been the LaMotte soil reaction set. It employs the rapid plate method. Ron helped me gather water samples from the area. We wanted to lab to run a bacteriological analysis on the water found in the area. Water samples were taken with a professional water scoop (Model B1079WA). All samples were put in a standard “Whirl-pak” bag. These bags are very good for holding water samples. They have a white write-on strip for easy identification, plus there is also a 4 oz. Fill-line, which serves as a guide to help the sample collector obtain the proper amount of water for standard test procedures. I also took water samples from the tree. These samples were placed on one well culture slides, which were placed into micro-slide mailers. These mailers are ideal for safe handling and will insure safe transferal to the laboratory. A total of 12 water samples were taken from the area. Rough sketches of the landing and surrounding areas were made. This information was passed on to our staff artist Tim Curry. The temperature of the surface soil was 39 degrees. A total of 10 hours was involved in the field investigation activities. With our field investigation now completed, we packed-up our equipment and samples and returned to Mr. C.H.’s house. We spent some time with Mr. C.H. going over various aspects of the case before leaving. On our way home, we stopped at the laboratories and gave them the samples and all necessary information needed for their testing. When we got home, all of the equipment was cleaned and a list was made of what replacements were needed. After the equipment was cleaned, the three of us compared our notes so a report could be prepared. From all of the information gathered and the tests that we conducted in the field, we all agreed that nothing unusual was detected from the samples collected. We definitely didn’t have a Delphos, Kansas situation, however we did agree that something had landed. Several days elapsed before we started receiving the laboratory reports on our samples. I won’t relate the technical data of those reports, but just a small summary of their findings.. 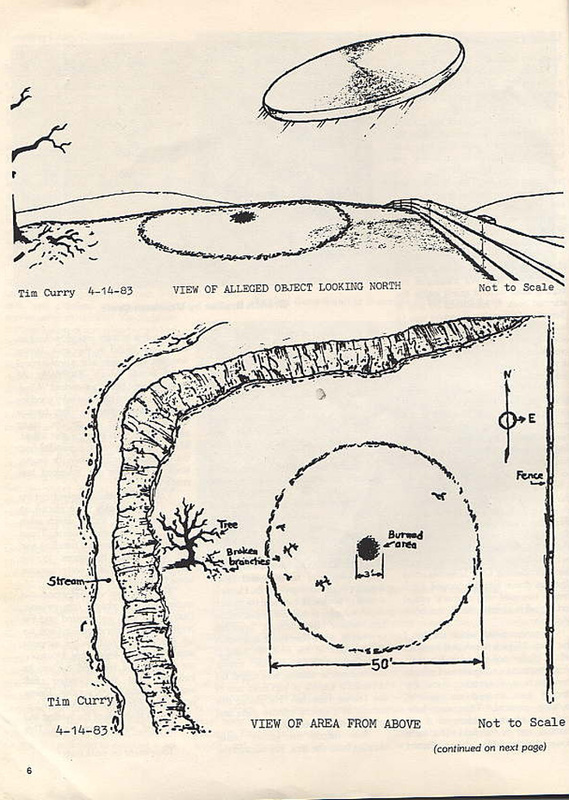 Anyone interested in the laboratory data and maps, who are doing research into the geological and biological aspects related to UFO sightings, may obtain copies from OUFOIL. Among the 32 core samples and the 12 auger samples taken, inside and outside the landing area, not one sample tested revealed anything out of the ordinary. Since there were no characteristic changes in the soil, only the basic tests were run. If something would have been found unusual, then many more precise tests would have been performed. Samples from the three foot diameter burned area in the middle of the landing area underwent special tests. These tests were for the purpose of checking for any type of combustible substance, such as gasoline, kerosene, butylene, etc. The tests showed no signs of a flammable element in the soil. However, these samples did have one aspect about them that the others didn’t. All other samples had a wetness depth of 10 to 14 inches, while these had a wetness depth of no more than 4 inches. It was the opinion of the laboratory people that these samples were subjected to some kind of extreme heat. All water samples submitted for testing proved to be normal. Even the bacteriological analysis was normal. It was evident that the unknown craft had no effect on the water in the area. Analysis of the vegetation, insects and other samples submitted proved to be normal. Some of the grass samples showed signs of being burnt. No traces of a combustible substance were detected. Several samples of wilted vegetation proved to be caused by heat. Various insects, such as the Hymenoptera ant, were tested showing signs of exposure to heat and some being crushed. The sample of sap contained some sugar and other substances, but proved to be normal. As in the other tests, not one showed signs of being other than normal. Mr. C.H.’s veterinarian stated that he found nothing wrong with Mr. C.H.’s dog. The only thing that seemed a little out of the ordinary was the dogs eyes seemed to be “running” more than normal. Beyond that, he stated that the dog was in good health. Ron and I did character checks on the witnesses, especially Mr. C.H. All had very good reputations and were well respected in their communities. Mr. C.H. seemed to be an exceptional individual, who was always helping others. We talked to everyone from their neighbors to the local police. We found no reason not to accept what the witnesses thought they saw. An extensive search was made for additional witnesses, but no others were found. All police departments, airports, weather bureaus, gas and electric companies, military facilities, etc., were contacted for any possible additional information applicable to the case. We even did a complete follow-up report 30 days after the sighting. Again, nothing new was revealed. In conclusion, it is our opinion that some unknown craft did indeed land on the property of Mr. C.H. on the evening of April 10, 1983. None of us are claiming that the unknown craft was a flying saucer. There is no hard documented evidence to support that claim. Unless some important evidence should surface, we are listing this sighting and all the events involved, as simply an unknown. This article was reproduced by Joan Woodward (Animal Reaction Specialist) and the web page was constructed for the NICAP site by Francis Ridge, NICAP Site Coordinator.